Univ’s Libraries support undergraduate and graduate study with around 60,000 books as well as access to the University’s e-resources. The Libraries, with 24-hour opening during term, offer a fast book request service, generous book allowances and loan periods, and professional staff on hand to help. As well as providing a quiet and disciplined study space, there are two group workrooms available for drop-in sessions or by making a booking. The Old Library, situated in a Victorian building next to the Hall, houses Modern Languages, Philosophy, English, Classics, History and the hard sciences (Maths, Computation, Physics, Engineering, Earth Science, and the Biomedical Sciences). 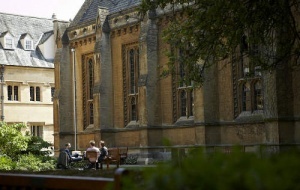 The New Library, which opened in October 2016 on Merton Street, contains Law, Politics, Economics, Music, and collections about Oxford, College, and books by and about Old Members. The Library has a generous budget for text books, but also provides a collection of books on study skills, writing essays, and staying healthy. In addition, students can make use a range of “extras” such as book-stands, whiteboards, cushions, earplugs, and vases for carnations during exams. 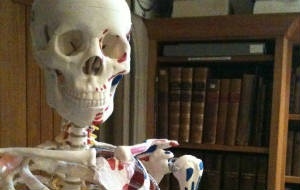 We also have subject-specific items like Obadiah, our life-size skeleton, a model brain, molecular models, and a collection of Shakespeare DVDs. Students can keep up to date with what’s happening in our Libraries via regular social media posts on Twitter. The Librarians and Archivist promote Univ’s historic collections through various classes, exhibitions, and the regular “Treasures” feature on our News and Features page. Appointments are available from 9.00 am on weekdays, with some restrictions at busy times of the year. Only Univ’s historic collections appear on Search Oxford Libraries Online (SOLO); for anything else use our online catalogue UnivCat. Requests for books can be made on the Univ Intranet under Info A-Z / Request a Book. Following a number of gap years, Elizabeth studied Library and Information Science at Curtin University and Latin at the University of Western Australia. A voluntary position cataloguing pre-1800 books at the New Norcia Benedictine Community led to several years working on antiquarian projects based in the Bodleian Library. Having worked briefly at Univ in 2002 as part of the Early Printed Books Project, Elizabeth was pleased to return to take up the Assistant Librarian post during the long vacation of 2009, followed by that of Librarian in September 2011. Outside the Library Elizabeth spends time promoting and practising the inky craft of letterpress printing through her private press, Juxon Press, and as a committee member of the Oxford Guild of Printers. 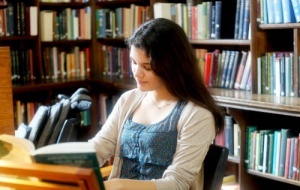 Following an enjoyable three years at Durham University Library, Emily completed a traineeship in the libraries and archives at Magdalen College, before studying for an MSc in Library and Information Studies at Aberystwyth University. She joined the team at Univ in 2013 and is particularly interested in Information Literacy and the History of the Book. Outside of work, Emily enjoys reading, knitting and walking holidays along the coast. Jessica moved to Oxford from the Isle of Wight in 2010 to study for a BA in French and Spanish at Keble College. After obtaining a 2:1, she went to Guildford for a year and achieved an MA in Translation (with Distinction) from the University of Surrey; she then returned to Oxford and has been working in libraries ever since, as well as doing freelance translation, subtitling and proofreading. She is excited and proud to add Univ to the growing list of Oxford libraries in which she has worked – her previous roles were at Corpus Christi College, St Peter’s College, the Taylor Institution, and Mansfield College. Outside of work, she enjoys creative writing, and some of her short stories have been published in Double-Decker (Bombus Books, 2016) as well as through the SaveAs Writers International Competition 2017. After completing his schooling in Cape Town, Phil went to Rhodes University where he completed a BA in Law and German, followed by an Honours degree in Music, and then a P.G.C.E. A stint teaching school music was followed by an MA in Musicology at Bristol. Finding that he was spending a lot of time in libraries he took up employment in the Wills Memorial Library at the University of Bristol until he was appointed to the Bodleian Music Faculty Library in 2016 where he now works in addition to his post at Univ. Also a PhD candidate in Musicology and History at the University of Bristol, he now spends all his time in libraries, but when he gets outside he sings in several choirs, is a locum organist, enjoys a game of cricket with the Bodleian C.C., and flits around on a bicycle. Robin read Classics at Univ as both an undergraduate and a postgraduate, and then trained as an Archivist at the University of Liverpool. He then returned to Oxford, first of all to catalogue the papers of Benjamin Jowett at Balliol and then to work at the Oxfordshire Record Office. Robin has been Archivist of Univ since 1993, but from 1996-2016 he was also Archivist of Magdalen College. He is now Archivist both of Univ and of Jesus College, and divides his time between those two Colleges. He is normally at Univ on Mondays and Tuesdays (01865 276952). 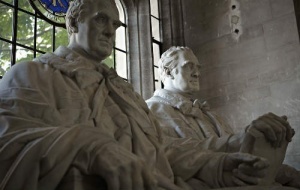 Robin’s publications include A History of University College, Oxford, published by OUP in 2008, and The Early Records of University College, Oxford, published in 2016.